Red Modcloth Flats first surfaced on Chictopia's streetstyle gallery in Spring 2013 seen on Grand Rapids blogger selectivepotential of selectivepotential.com. She wore her red modcloth flats with a white modcloth dress and red Forever 21 belt. 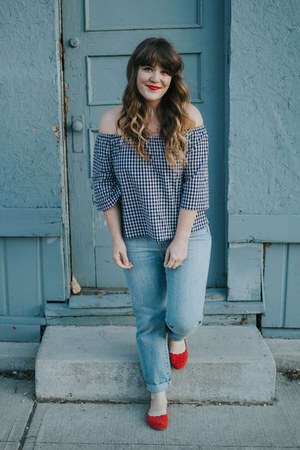 Since then, Red Modcloth Flats have grown in popularity as bloggers from Grand Rapids, Lawrence, and Indianapolis have discovered them. Red Modcloth Flats are generally seen in casual, chic, and preppy style. A popular type of Red Modcloth Flats are plaid pointed toe. There are currently 7 streetstyle photos of bloggers wearing Red Modcloth Flats. Most recently, blogger selectivepotential of selectivepotential.com rocked her red modcloth flats with a tawny madewell bag, white others follow top, and mustard modcloth skirt.